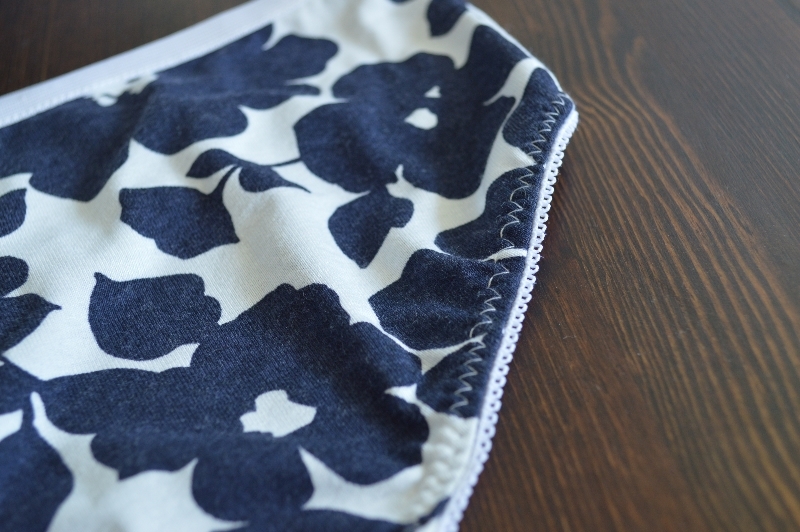 Here they are, my finished and almost perfect Muji-copycat knickers! I decided to use the white elastic instead of black and I think it looks rather good. Thanks Emmely for your advise, it’s always nice to have a second opinion! For my next pair I will definitely increase the elastics a bit and hope that it’ll turn out better than this. Oddly enough I still can’t bring myself to post pictures of myself wearing just knickers. However, I came up with the great idea of showing you a cartoon version of myself. I am proud to present my colourful twin sister! Categories: Underwear | Tags: knickers, sewing, underwear | Permalink. I totally get not being comfortable posting pictures wearing nothing but underwear. I can’t really tell from the picture but it looks as if the skipped stitch is always on the same side. I read somewhere that a solution for skipped zig zag stitches might be to sew one stitch at a time or to use the handwheel instead of the pedal so you go slower and this should help the needle and bobbin hook timing. Oh my, that would take forever! Did that advise apply to all fabric or just stretch? My machine seems to be doing just fine with a non stretch cotton but when I stretched this fabric too much, I ended up with these skipped stitches. I think it was also about sewing with elastic. If stretching the fabric a bit less does the trick I agree that would be much preferable!